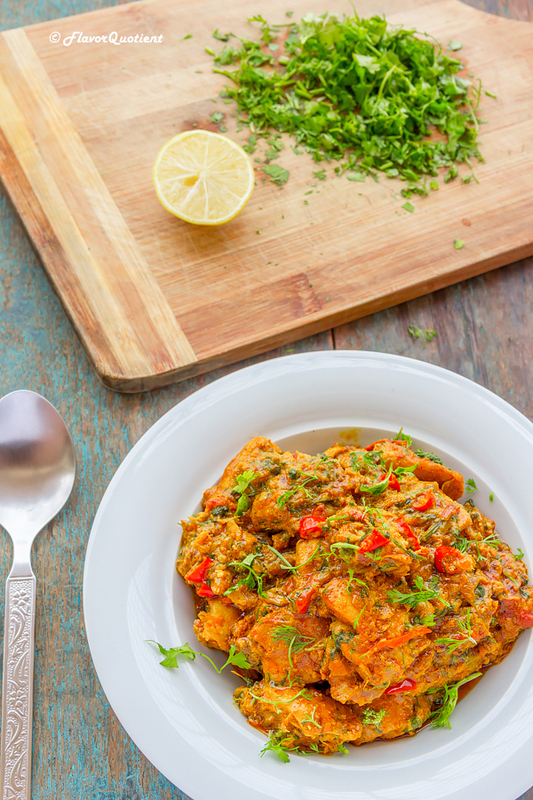 This Indian spiced chilli & ginger chicken is a perfect treat for a bright weekend which you decide to enjoy at home with friends and family or even all by yourself! 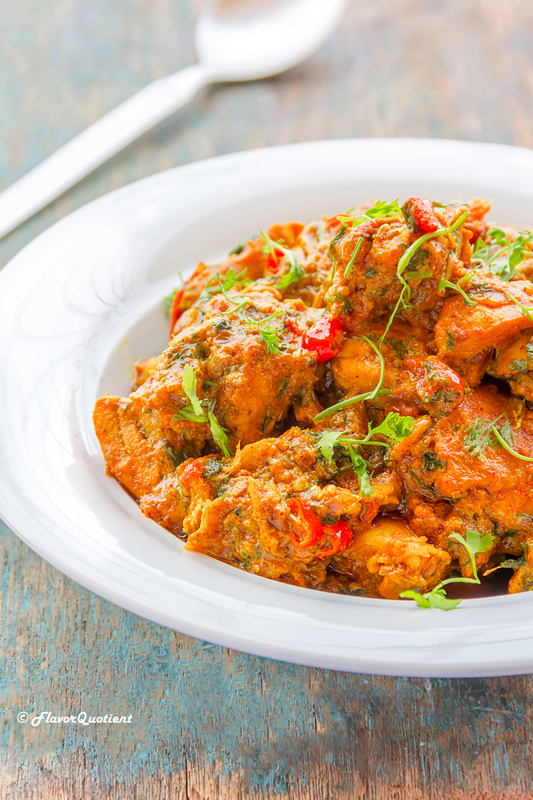 Today I bring to you an Indian spiced chicken recipe which is sort of a chicken curry but not quite so. 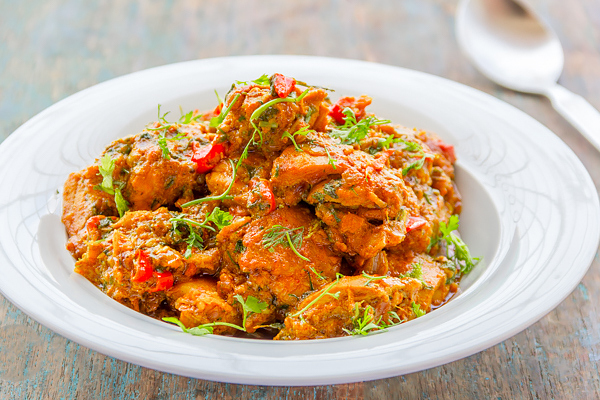 It is pleasantly different from classic chicken curry but packed with all beautiful aroma of Indian spices. 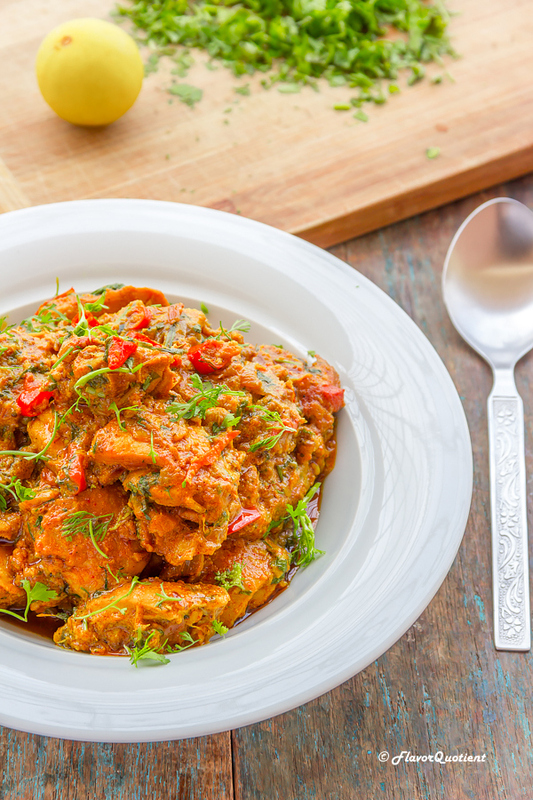 This chicken dish is primarily dominated by flavors of ginger with a subtle kick of chillies, but all is perfectly amalgamated in a yogurt-based gravy. If you are looking for the classic restaurant style ginger chicken curry, then this is not the one. 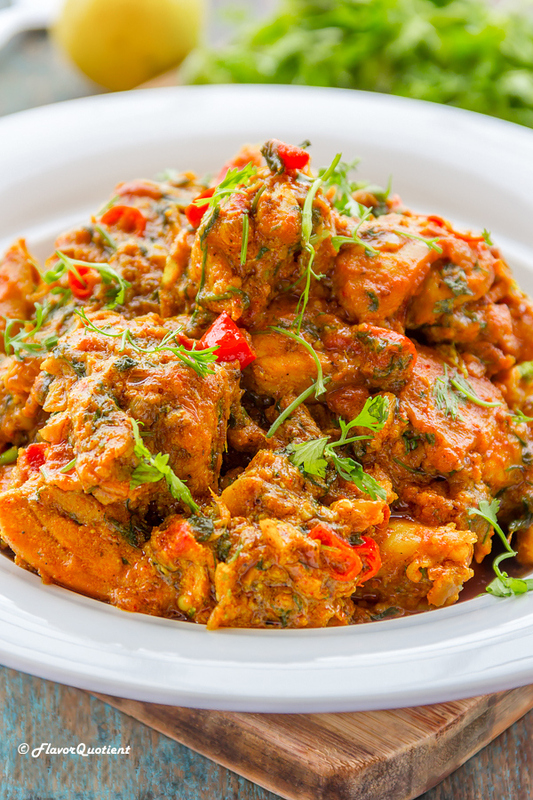 For that you will have to head over to my Indian recipe blog – Everyday Indian Recipes and you will get the classic ginger chicken curry recipe there along with many other classic as well as fusion Indian recipes! The use of toasted whole spices – cumin seeds and coriander seeds – adds a whole new dimension of flavor to this chilli and ginger chicken. I would urge you to toast the whole seeds on your own and do not use the readily available ground cumin and ground coriander. Using already ground spices is never same as using freshly toasted and ground coarse spices; you can definitely use ground spices in many other curry recipes but not exactly in this one. Trust me, this extra effort of toasting and grinding the spice on your own is all worth it! I am sure I am repeating myself, but I really can’t help but reassure you of one thing – Indian food is actually quite easy to make, trust me on this. If you are the one who gets intimidated with Indian recipes, please do not. If you follow the recipes as instructed, there is no way that you can mess it up. And if you get confused with the spices, just keep the basic ones handy i.e. turmeric, cumin, coriander, chilli powder & garam masala and use the amount as mentioned in the recipe; you will be sorted for good. I am sure all these spices will be available in the Indian section of your supermarket, or if you are from India, then you already have everything in your kitchen! Get going! My love for food has helped me expand my horizon of food and I honestly enjoy food from every corner of the world. Traditional recipes from any country or culture speak a lot about the heritage of the place it belongs to. A classic dish, for example a classic biryani, is not just a dish but a story altogether and I desire to read as many stories from the world as possible in my whole lifetime. But there is always one little story which you wanna read again and again because it brings comfort to your soul and that’s exactly what Indian food is to me; not only because I have been brought up on that, but also because I am in awe of the vastness of our Indian cuisine. Today’s chilli & ginger chicken is just a tiny portion of it which I am sharing with you all to spread the joy of food which is the core essence of our culinary culture. Wash the chicken thighs and drain all water out. Cut each chicken thigh into 4 pieces. Set them aside. Heat a small fry pan and add the whole coriander & cumin seeds to it. Dry roast the whole spices (i.e. without any oil or fat) on medium heat for couple of minutes or until fragrant and turned dark in color. Transfer the toasted spices to a mortar and grind them to a coarse powder using a pestle. Set it aside. Take the chicken thigh pieces in a large bowl. Add ginger paste, garlic paste, chopped fresh red chilli, juice of half a lemon, yogurt, turmeric powder, toasted coriander & cumin seeds powder prepared earlier and a teaspoon of salt. Mix them well using a spatula and let it marinate in refrigerator for couple of hours. When you are ready to cook, heat a skillet and add mustard or vegetable oil to it. Once hot, add the chopped onion and give a quick stir. Then add chopped ginger and minced garlic. Sauté all the aromatics on medium heat until the onions turn golden brown, about 8 to 10 minutes. Then add the chopped tomatoes and keep sautéing until the tomatoes are soft and integrated with the onions. Next add the powder spices – coriander, cumin and turmeric. Cook them on medium heat for couple of minutes. Then add the knob of unsalted butter, let it melt, then stir to mix everything well. Now dump in the marinated chicken along with all the marinating liquid. Stir them well and let the chicken cook on medium heat. Add red chilli powder and give a quick stir. Sauté the chicken until all the liquid is absorbed, uncovered on medium-high for about 15 minutes. This sautéing will add lot of flavor to the curry. Once all the liquid is absorbed and chicken is nicely braised, add about a cup of water and let it come to boil. Season it with salt to taste and cover and cook on low for about 15 minutes or until chicken is completely cooked. Uncover and check the doneness of chicken. If chicken is done, adjust the consistency of the gravy as per your liking; you can add little water if the curry seems to be too dry or boil off any excess if it is too watery. Check and adjust for seasoning if needed. Finally garnish the chilli & ginger chicken with freshly chopped coriander leaves and serve it warm with plain white rice. Enjoy! This recipe is enticing! I look forward to trying it out.